Halloween Cake Recipes: Pumpkin, Dirt and more! October is here! Which means it's time to start thinking about what fun Halloween treats to create for those parties you'll be invited to (or hosting!). I've only recently started getting more creative with my holidays since I've had my daughter, but I've realized that I probably should have started long before that. It's really kind of fun. 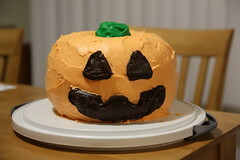 So far, I've made filled cupcakes, dirt cake, a decorated Halloween cake, and a 3D pumpkin cake - all Halloween themed. As I started making these treats, I discovered that you can make anything holiday themed as long as you had some imagination and some food coloring. The first thing I'll talk about is the easiest. Filled cupcakes. Who doesn't remember eating Hostess cupcakes? You peel the chocolate frosting off the top and then split the cake in half to reveal the fluffy white creme filling. Yum. Now it's awesome if you have the time to make both the frosting and the cake from scratch, but I'm a working mother of a 2 year old with a life outside the kitchen. Needlessly to say, I do not make my cake or frosting from scratch often and if I do, it's only for my family, not work functions. If you've read any of my previous posts about cake though, you'll know that I whole heartedly defend the usage of boxed cakes. Enough of that. You can use any flavor cake and frosting that you like. I have used yellow cakes with vanilla frosting and chocolate frosting or chocolate cake with chocolate frosting. It's really up to you and what you feel you want to make. Although I haven't tried it, I imagine that lemon cake with vanilla, chocolate, or lemon frosting would be really good too. You really can't get any simpler than this. Put the cupcakes in the oven, while they're baking, make the filling. Once the cupcakes are done, take them out and when they are only slightly warm, fill your cupcakes by inserting pastry bag/cake decorator fitted with a large round tip. Squeeze until the top of the cake puffs out a little. Then take it out and frost once the cake is completely cool. DONE. Here is the recipe for the filling. INSTRUCTIONS: In a mixing bowl, put milk, granulated sugar, Crisco, salt and vanilla. Beat for 10 minutes. Then add water and powder sugar: beat until fluffy. YEILD: Makes enough for 3 dozen. There are some tricks to filling them that I will mention and hopefully save you some heart ache. If you are using a zipper lock bag as a pastry bag to put the filling in, you'll have to squeeze harder or hold the bag in a fashion that the bottom of the bag barely moves. Otherwise you won't get enough frosting in. Make sure you keep an eye on the top of the cupcake to watch it puff up. If it starts to crack, you may have too much creme inside. If you don't want to go through the time of making cupcakes, you can make your cake in a 9x13 pan and then randomly inject the creme filling all over the cake and then frost the entire thing. It's a great surprise in the plain old generic office cakes everyone sees so often. You can easily split the recipe after it's been made and dye them in separate bowls so you have different colors. The dirt cake and the decorated cake are just slightly harder, but not by much. 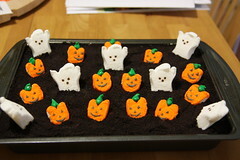 For the dirt cake, all you have to do is follow the recipe, dye the cream cheese mixture orange, layer it in a 9x13 pan, and finish it off with some spooky candies like Peep ghosts, pumpkin shaped Mellowcremes, and Nilla wafers (write RIP on one half and stick it in the dirt cake for a tombstone). You can get really fancy and pipe vines off of the pumpkins for vines. 1. Beat the shortening and butter together until it looks fluffy. 2. Add sugar and continue to cream until it's mixed well. 3. Add salt, vanilla, and cream, mix until blended. 4. Beat at high speed until the frosting is fluffy. About 5-10 minutes. 5. Add gel food coloring if desired. If you are feeling a little craftier, you can try a 3D cake. I made one for my team last year and they loved it and I couldn't believe how easy it was. Bake two bundt cakes and 2 cupcakes using two cake mixes. Just fill a cupcake mold 3/4 of the way and pour the rest of the batter into the bundt pan. Once the cakes are cool you can start frosting the cake. Place one of the bundt cakes with the rounded part down on your serving dish and frost the top of it (the flat part only). This will be the middle of your finished cake so you can take this opportunity to dye your frosting a different color or get really creative with a filling. After the top is frosted, place the other bundt cake on top with the flat side facing down. If there are decorative lines on the outside of your bundt cake, now would be a good time to line them up. It's not an extremely necessary step, but it will make your cake look better depending on your frosting skills. 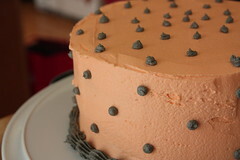 The next step is to frost the top of the two layer cake with orange frosting. You don't have to go all the way down on the outside, but make sure you get the inside of the hole a bit. 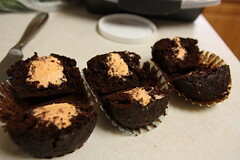 Next you'll drop one of the cupcakes (if you used a paper liner for the cupcakes, you need to take them off first before using them in your cake) into the hole with the top facing up and frost the top of the cupcake with orange frosting. Turn the second cupcake upside down and place it on top of the already frosted cupcake. This is your pumpkin stump, so you'll want to frost it green. Be careful that it doesn't shift too much while you're frosting. If it does move a lot, you can use 3 or 4 toothpicks to hold them together. Carefully frost the rest of the pumpkin with orange frosting and pipe on the jack o' lantern face of your choice with black frosting and you're done!